There are reasons to be down on the game of golf. Labor challenges, unusually wet or dry weather patterns, aging golfers, rising expenses — they can all keep a superintendent up at night. And yet, expectations are high for 2019, with 72 percent of readers who took our fall 2018 survey reporting they are either very optimistic (20 percent) or optimistic (52 percent). Additionally, only 8 percent of respondents expect to see their maintenance budgets cut in 2019, while 39 percent expect an increase and 53 percent believe their budgets will remain flat. Along with surveying our readers, we also reached out to several industry pundits to get their expert opinions on the upcoming year. Our conversations about 2019 included Golf Course Superintendents Association of America CEO Rhett Evans; National Golf Course Owners Association of America CEO Jay Karen; ClubCorp CEO David Pillsbury; Southeast Agronomist for Golf Maintenance Solutions (and former GCSAA President) David S. Downing II; and Aquatrols CEO Matt Foster. All of those contacted were optimistic for 2019, and for various reasons. Former GCSAA President (2008-2009) David S. Downing II has had a diverse career in golf maintenance. From hosting 11 televised events to growing in — and opening — four courses on the same day, Downing has seen most everything in the golf business. He now works to share what he has learned as the Southeast Agronomist for Golf Maintenance Solutions, a company created by superintendents that advises clubs on agronomics, irrigation, construction, capital improvements and due diligence. Based on what he has seen over the last couple seasons, Downing casts his vote in the “optimistic” category. “We’ve been excited about all the renovation work that’s going on. It tells us that the cash situations are getting better,” Downing says. The cost of maintaining a golf course has “exploded” over the last 15 years, Downing says. As more courses do their homework and better analyze their productivity, they’re seeing more success. In late 2018, the staff at GCSAA celebrated a milestone. That’s just one reason why Rhett Evans, CEO of GCSAA, was feeling good about 2019. Evans anticipates 2019 to be a busy year for the team at GCSAA headquarters. Evans is bullish on the association’s Best Management Practices (BMP) initiative, with its goal of having individual BMP manuals for all 50 states completed by 2020. The BMP manuals will provide the general public with a document describing how each state’s golf courses are being proactive in properly using inputs to maintain conditions. 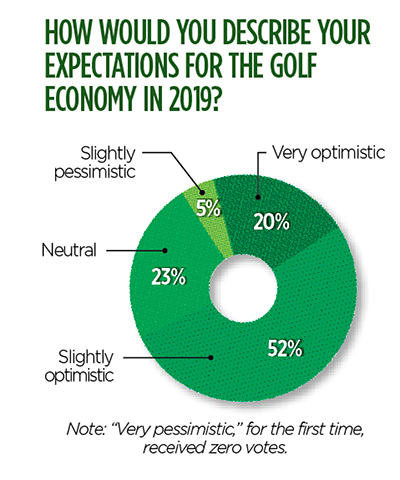 Jay Karen, CEO of NGCOA, chose “optimistic” for the Golfdom survey. It’s because he believes courses are pursuing new and different revenue streams to make their facilities profitable. Karen advises that all golf courses look beyond how many golfers play the course and instead consider the different ways a course can pull in customers. An advantage Topgolf has over the common golf course is that it’s weatherproof, Karen says. When the weather gets bad, courses lose inventory, and there is nothing the facility can do about it. 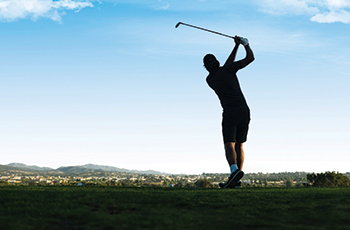 ClubCorp owns and operates more than 200 private golf and country clubs. ClubCorp CEO David Pillsbury selects “very positive” as how he views the golf economy in 2019, with two caveats. Pillsbury notes the PGA of America is making tremendous strides in connecting interested people with the game. He adds that data he has seen tells him that half of all nongolfers who played Topgolf are interested in learning more about playing the game on a green-grass golf course. (The company announced in December that it had purchased the controlling interest in BigShot Golf, a golf simulator game similar to Topgolf.) While his core business revolves around golf and country clubs and city clubs, he finds himself spending more time watching how the technology around the game is influencing today’s golfer and nongolfer. Something Pillsbury says he thinks is improving in the game is resolving what he calls a “friction” problem. “When you’re in the water management business, you look forward to not having one of the wettest years ever in the east,” laughs Matt Foster, CEO of Aquatrols. With the 2018 weather behind him, he’s “optimistic” for 2019. Every course can’t be a top 10 course, Foster says, but every course can understand the wants of its local golf market. Foster admits he’s biased toward the game. He says he’ll always bet on golf because of its importance to families and communities.